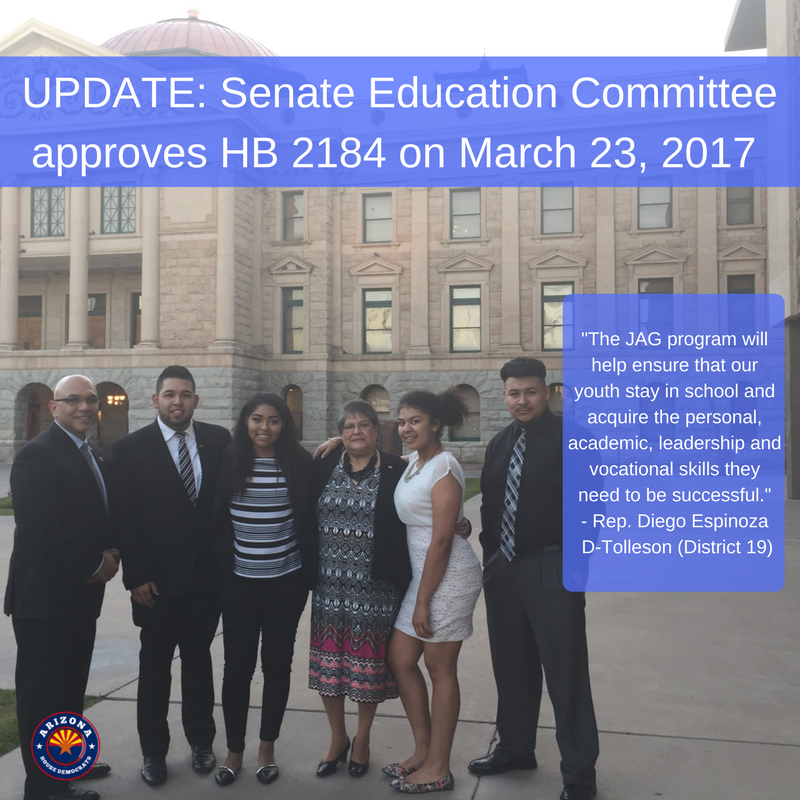 Rep. Diego Espinoza, D-Tolleson (District 19), introduced HB 2184, a bill that would provides support for programs that help at-risk youth prepare for college and careers. To see the full bill, click here. Rep. Jesus Rubalcava, D-Gila Bend (District 4), introduced HB 2082. The legislation would allow our students to have at least 50 minutes of unstructured recess each school day, to help keep kids active and ready to learn in the classroom. To see the full bill, click here. 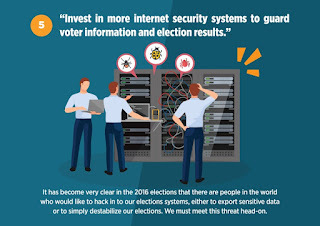 Recent events at the national and local levels have made it clear that we need to take action to ensure elections are accessible, secure and transparent. Elections in Maricopa County last year are remembered for long lines and frustrated voters. HB 2348 allows for automatic voter registration (AVR) for any Arizona resident obtaining or updating his or her driver’s license at the DMV, reducing voter registration confusion and obstacles. 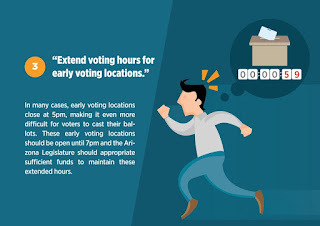 AVR is a simple improvement, which will save money, while registering more voters. HB 2349 will allow voters to designate a person to carry their ballot to a polling place for them by signing an affidavit on their secured ballot envelope. The affidavit will confirm that the voter has personally sealed the ballot and given approval for delivery to an election official. 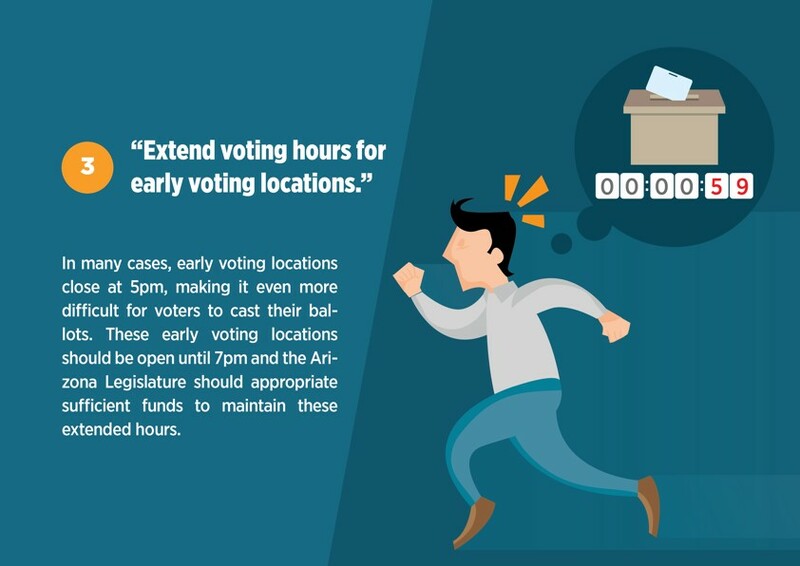 HB 2350 extends early voting polling center hours to 7 p.m. in response to the many voters who faced difficulty in casting their ballots at on-site locations due to early closing times last year. 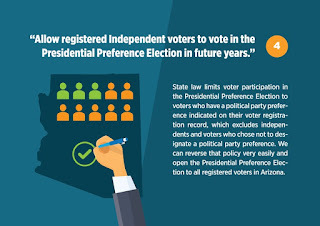 HB 2351 focuses on the largest demographic of voters in Arizona: those who register as Independent. 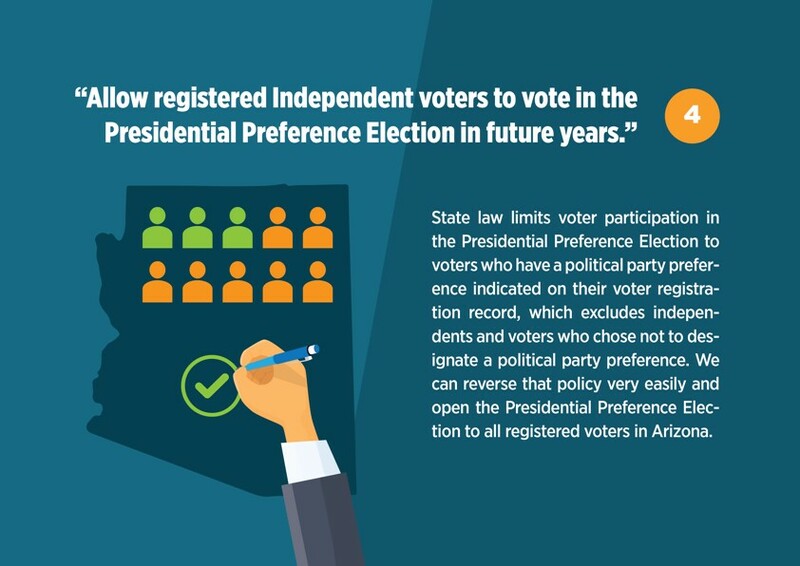 Arizona voters who choose not to designate a political party preference are legally unable to vote in the presidential preference election (PPE). 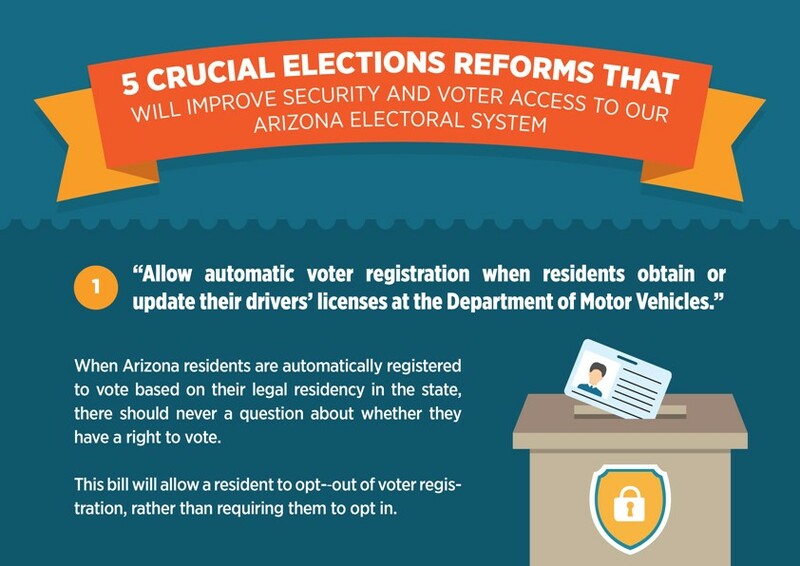 This bill would open the PPE up to every registered voter. 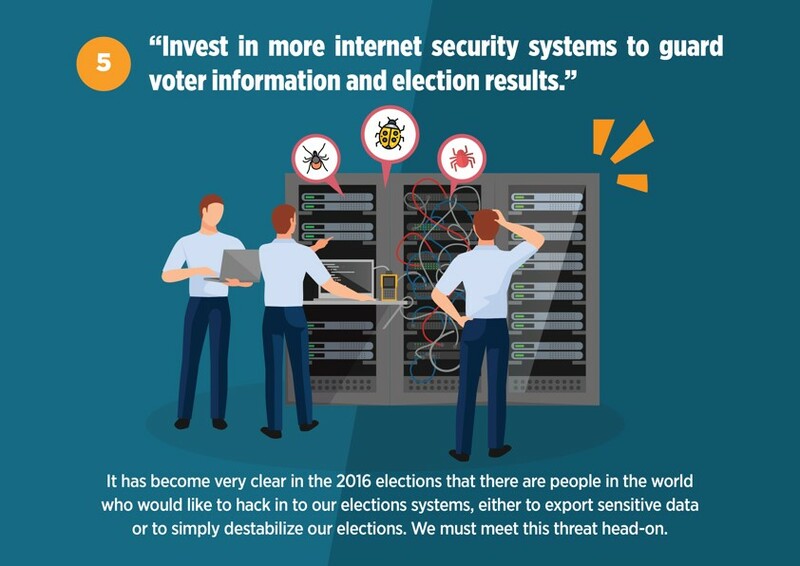 HB 2273 addresses internet security around our personal voter registration and polling data. The bill would provide $2 million for counties to increase internet security measures to prevent the theft of private information. 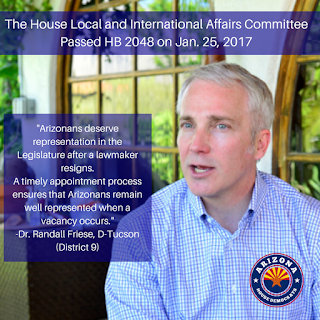 Arizona House Democrats support Rep. Clark's reforms because Arizonans should have their voices heard – at the ballot box and at the Legislature. 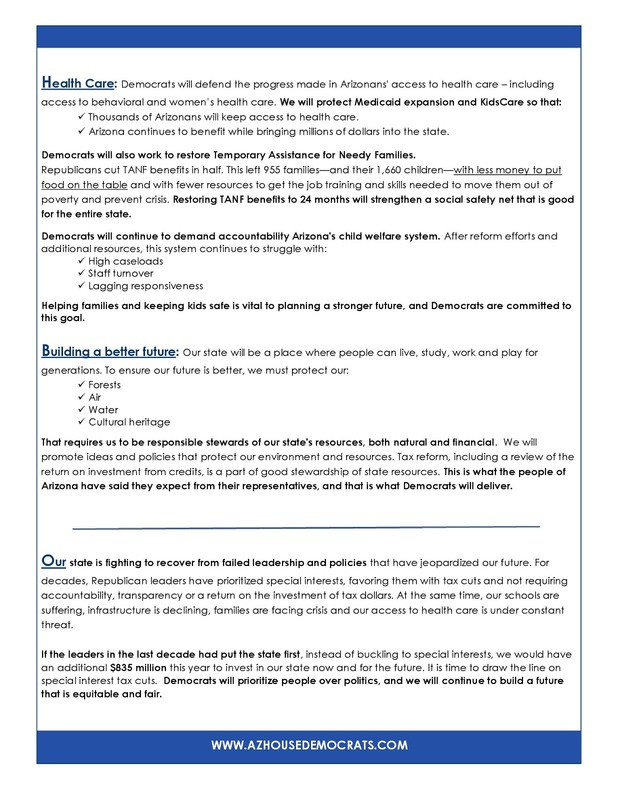 Rep. Athena Salman, D-Tempe (District 26), offered this floor speech to commemorate the Roe v. Wade decision and stress the importance of access to care. STATE CAPITOL, PHOENIX – Today, the Native American Caucus members issued the following statements regarding President Donald Trump's decision to reinstate the Keystone and Dakota Access pipeline projects. "I stand with Standing Rock in protest of President Trump’s decision to revive construction of the Keystone and Dakota Access pipelines. As an indigenous grandmother and great-grandmother, I believe we need to protect our environment, not only for our grandchildren but for the generations yet to be born." "This signals a lack of respect for Native Americans. The president’s decision allows a corporate takeover that neglects tribal consideration or consultation, fails to honor historical or sacred sites and prioritizes profit above people. Sustainable planning must happen for the survival of this planet and her children. I continue to stand with our brothers and sisters of tribal nations and beside the Standing Rock Sioux." "I am extremely disappointed to have learned yesterday that President Trump issued a memorandum that attempts to revive the controversial construction projects. Allowing these projects to once again move forward without meaningful tribal consultation is a direct violation of tribal treaty rights and threatens America's land, air, and water." "Protecting water as a 'thing' makes us environmentalists. Protecting water as a 'person', whom we embrace as family, makes us good relatives, and that’s what it means to be indigenous. Our truths continue to push against those who behave like they have no relatives. The actions of the new administration to move forward with utter disregard for what it means to be family and disregard for lawful tribal treaties and federal environmental law are an offense to a viable future. Despite this, we will endure, we have to. Our future depends on it." 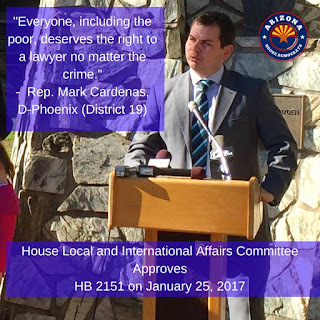 Rep. Mark Cardenas, D-Phoenix (District 19), introduced HB 2151, a bill that would require all money from the Indigent Defense Fund to go toward paying public defenders each year. To read the entire bill click here. 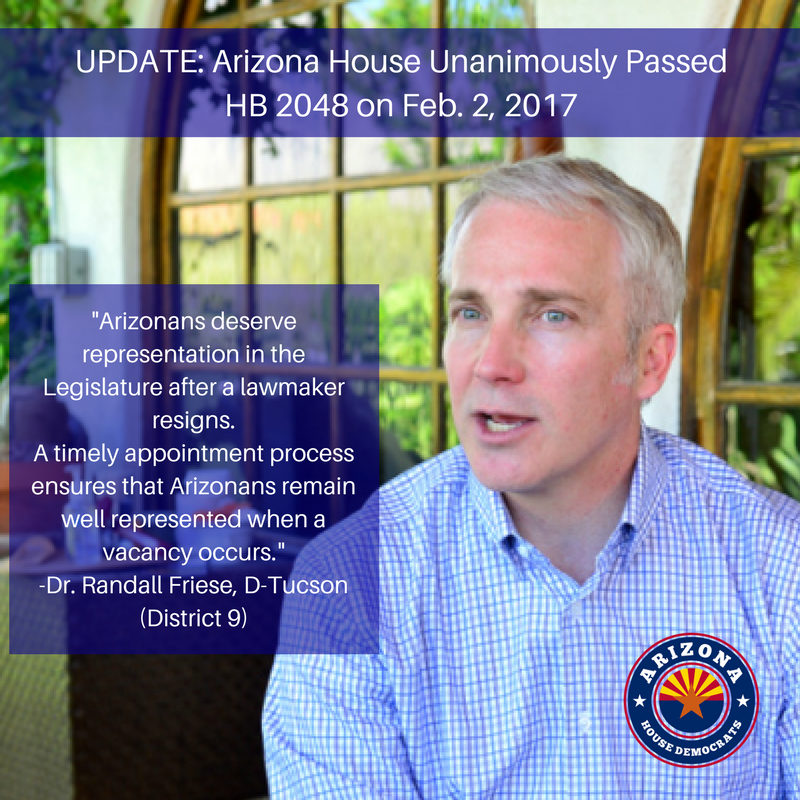 Rep. Randall Friese, D-Tucson (District 9), introduced HB 2048, a bill that establishes a timely appointment process in the event of a legislative vacancy. To read the bill click here. House Democrats are committed to ensure our state reflective of your values. We've been listening to folks all over Arizona, who say they want a state where families can live, study, work and play for generations. To achieve that, we are focusing on policies at the Capitol that will create jobs and improve schools so our kids have opportunities in the future. House Democrats will prioritize people over politics, and we will work toward a future that is equitable and fair. Below are some stories about the kind of state we want to build together. House Democrats are fighting for education, jobs, health care and a better future. To share your ideas about the Arizona you want tweet or share a link to a video and use the hashtag #ImagineAnArizona. Rep. Rosanna Gabaldon, D-Sahuarita (District 2), introduced HB 2140 a bill that will establish a Silver-Haired Legislature, creating a space for senior citizens at the Capitol. To read the entire bill click here. 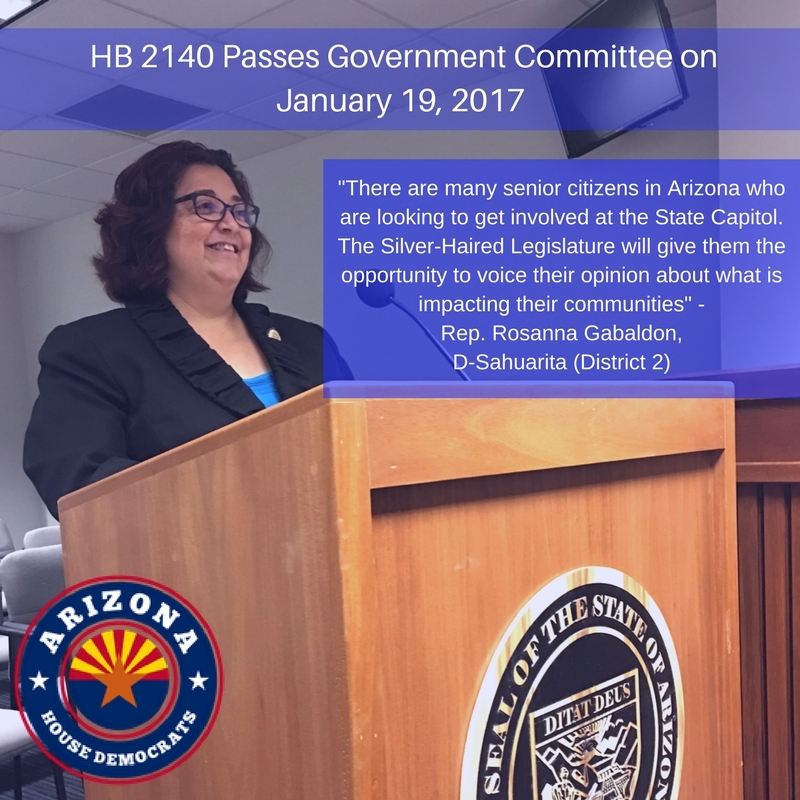 STATE CAPITOL, PHOENIX – Senate Democratic Leader Katie Hobbs and House Democratic Leader Rebecca Rios released this statement on Gov. Ducey's budget proposal. 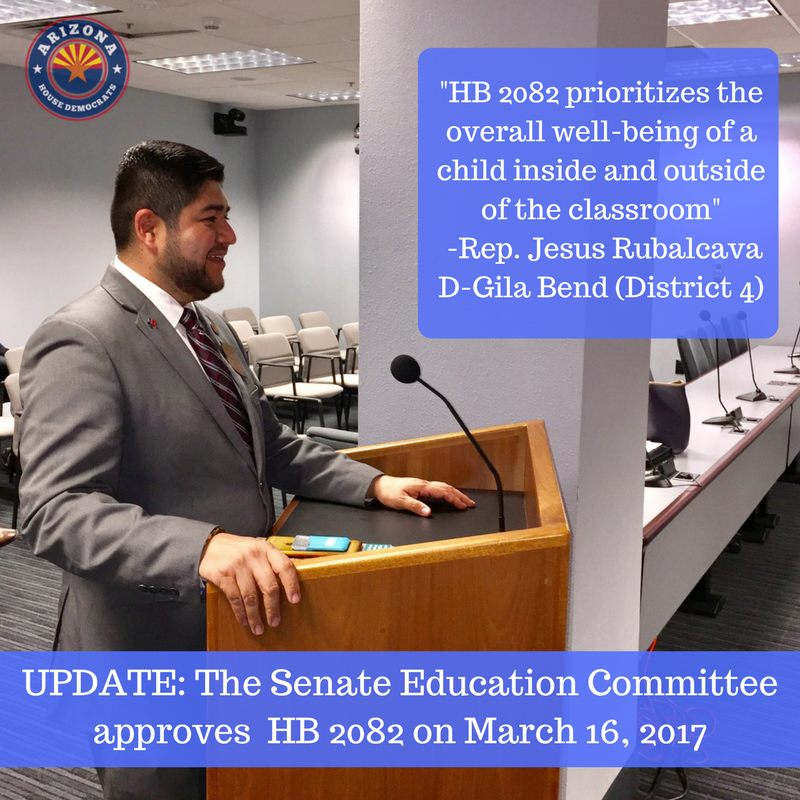 "In poll after poll, the people of Arizona have been very clear that more resources are needed in order for Arizona kids to be successful. The governor's State of the State address raised hopes about his level of commitment to education, but the devil is in the details. "He promised to finally invest in teacher retention and recruitment, but his budget offers teachers a raise of just four-tenths of a percent a year, which doesn't even keep pace with inflation. For new teachers starting at low-income schools, this budget does present opportunities. But for our most loyal teachers who have stuck with our schools through years of budget cuts and no raise, this is hardly a vote of confidence. "He promised increased funds for universities, but is pulling that money away from cities, towns and highways, while once again offering nothing to community colleges. "We know we see a return when we invest in kids. The same can't be said for the additional $107 million in state revenue we'll lose to unaccountable corporate tax credits, or the corporate STO credit that grows by 20 percent each year, or letting our roads fall further into disrepair. "It's easy to cut programs, like TANF and JTEDs, then restore them and claim to be the hero. The same is happening with education. Governor Ducey spent the vast majority of his State of the State speech touting all the good he has done and will do for Arizona's schools. But after almost a decade of neglect, they need more than mile-wide-and-inch-deep platitudes. This is a crisis of the majority's making. It's long past time to make meaningful and sustainable investment in our education system, one that prioritizes students over special interest tax cuts. We can make these investments by ending irresponsible tax cuts, committing real state dollars to schools and renewing Prop 301 at a full cent. "Democrats have offered solutions that would make a difference in our schools and our economy. They are solutions that can be easily achieved by working together, which we have always been willing to do. We will continue to prioritize people over politics and advocate for real, long-term changes that ensure a prosperous future. To Governor Ducey and the legislative majority we say, let's get this done. 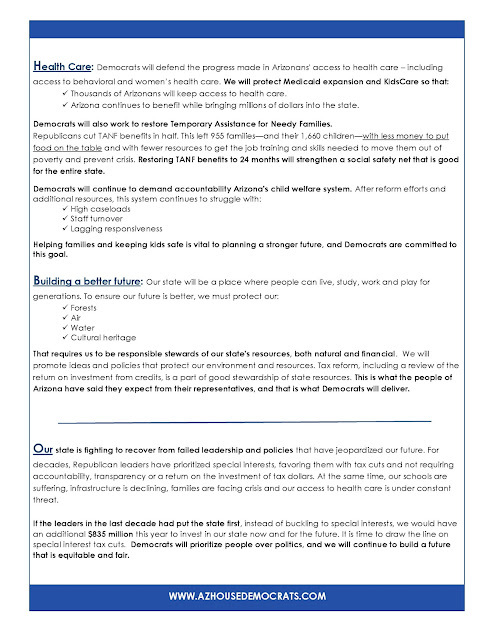 Arizona Democrats are working for an inclusive and prosperous state. Below is our plan for building a better future for the families who live, work and play here. STATE CAPITOL, PHOENIX – Rep. Eric Descheenie, D-Chinle (District 7), and members of the Native American Caucus stood with the Havasupai and neighboring tribes despite President Barack Obama's decision not to designate the Greater Grand Canyon Heritage National Monument. Leaders urge Obama to reconsider its designation. at a press conference on Wednesday, Jan. 11 at the Arizona Capitol. To view the press conference, click on the video below. 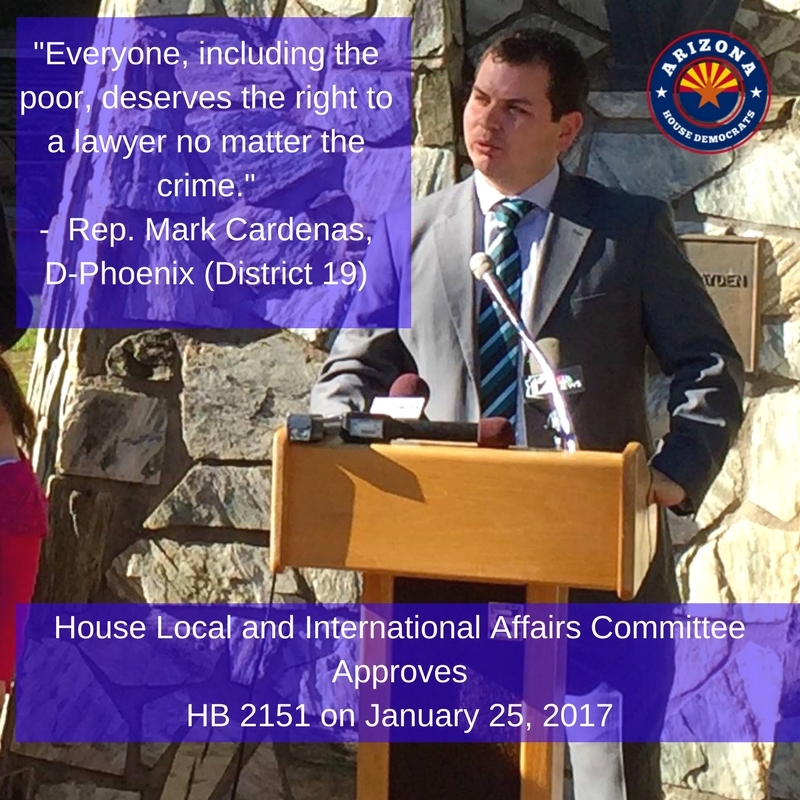 Today Senate Democratic Leader Katie Hobbs, D-Phoenix (District 24), and House Democratic Leader Rebecca Rios, D-Phoenix District 27), filed a brief with the Arizona Supreme Court in support of Prop. 206. 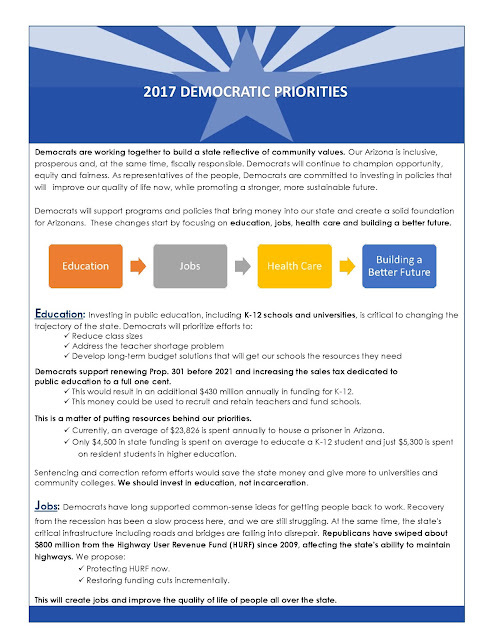 STATE CAPITOL, PHOENIX – Senate and House Democratic leaders released these statements regarding the 2017 Democratic priories. 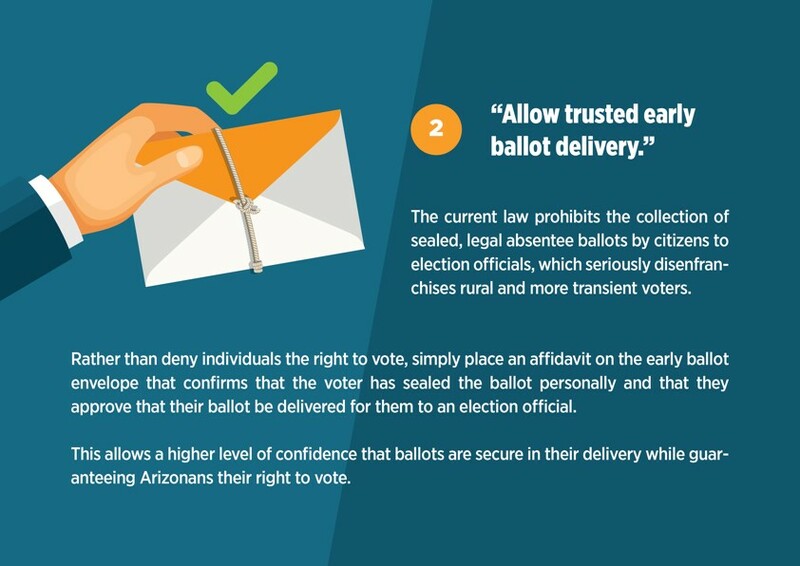 "The state of Arizona is facing a challenge that was created by this Legislature. Years of corporate tax cuts, falsely passed as ‘jobs bills’, have left state agencies hindered and the critical services they provide limited. We can and must do better for the people of Arizona. "We must prioritize the programs and services that voters have said time and time again - in poll after poll – they overwhelmingly support. Our public safety nets must be strong, our roads must be repaired and expanded, and our public schools must finally see an investment that demonstrates a commitment to the future of our children and our state. "As the 16th most populous state in the country and growing, the need for these vital services will not diminish. But we pay for them through a tax structure that is stacked against the middle class and favors special interests. "This Legislature must not endorse the current frenzy in DC to rip apart AHCCCS, KidsCare and Obamacare with no replacement plan of any kind. To do so would nearly double the number of uninsured Arizonans and would immediately remove more than $3 billion from our economy. "And after years of reform and millions of dollars, Arizona's child welfare system continues to struggle with high caseloads, startling staff turnover statistics and children languishing in a foster care system that too often fails them. "Continuing the policy of slashing services for the working poor while forcing them to take a greater tax burden than corporations and the wealthy is unsustainable and grossly unethical. We must protect and strengthen the services that only the state can provide and which the people of Arizona overwhelmingly support." "Democrats are working for a state where people can go to school, get a great education, find a prosperous job, live in a safe community and ensure their children have bright future. It is a state that is both prosperous and inclusive. "Arizonans value equity and fairness, and it is our job to ensure the government represents those values. We have an obligation to be fiscally responsible, accountable and transparent. To meet that mandate, Democrats will support programs and policies that build a solid foundation. "That means investing in public education at the K-12 and university levels so schools have the resources needed to prepare our students for the future and so that college is affordable. When we prioritize education, we increase the strength of our future economy. It also means protecting the gains we have made in individual rights and in access to health care, including Medicaid expansion and KidsCare. "Our state is fighting to recover from decades of failed Republican leadership and policies, which put the needs of special interests above the needs of Arizonans. Democrats will always prioritize people over politics." STATE CAPITOL, PHOENIX – The House Democrats today announced that Cynthia Aragon is the new Democratic chief of staff. There are several additional changes to the staff this year. 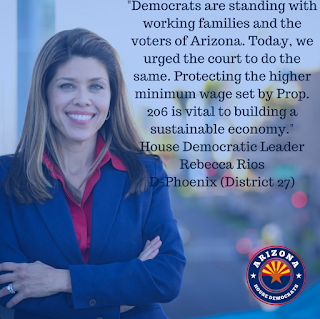 "We have a great team going into this upcoming session, and I look forward to what we can accomplish," House Democratic Leader Rebecca Rios, D-Phoenix (District 27), said. Aragon has been a member of Democratic staff for eight years and previously worked as the advisor for the Committee on Federalism and Property Rights, the Committee on Children and Family Affairs and the Committee on Transportation. She has more than 15 years of experience in community engagement and empowerment. Aragon earned her bachelor's degree from Arizona State University and is currently working on her master's degree from University of Arizona. "I am honored and humbled to serve as the House Democratic chief of staff. We are ready to support a group of thoughtful leaders who will work for the interests of Arizonans," Aragon said. Magali Bearden will serve as a policy advisor. She is a Phoenix native who graduated from Northern Arizona University. She was an intern for the House Democratic staff during the 2013 legislative session. Andrew Loucks was promoted to the position of policy advisor. He holds a bachelor of science degree from Arizona State University. He began his legislative career in 2015 as an intern for the House Democratic staff, and he has been on staff part time for around a year. Jackie Sandoval also was promoted and will now serve as the communications and outreach liaison. She had been the executive staff assistant since 2014, which was the same year she earned her bachelor's degree from Northern Arizona University. Paulino Valerio joins staff as a policy advisor. He was an intern for the Senate while attending Arizona State University in 2012. Valerio was the identification and recruitment coordinator for the Migrant Education Program at the Arizona Department of Education before joining the House Democratic staff. 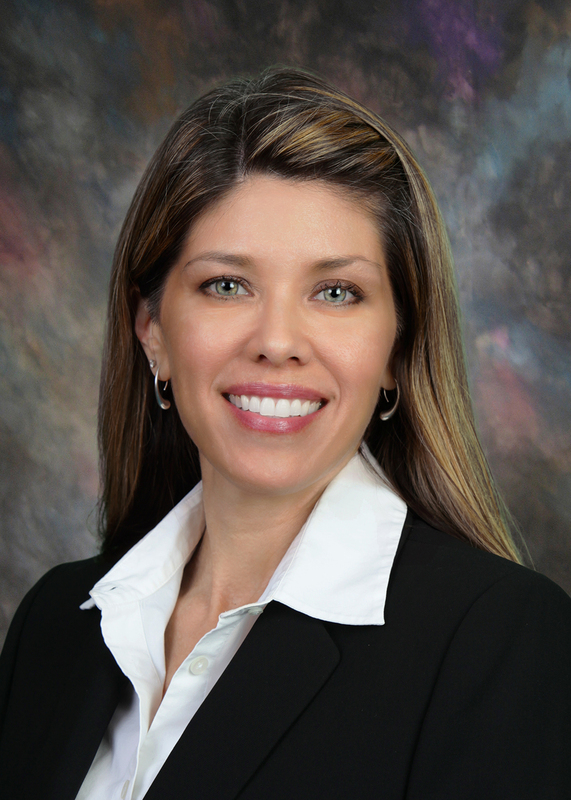 Carmen Velarde has taken on the role of executive staff assistant. She has worked a total of 18 years at the Legislature in both the House and Senate chambers. She received her bachelor of arts degree from Northern Arizona University and will be receiving her certificate in paralegal studies from Phoenix College.